The first people came to Greece not long after leaving Africa, about 55,000 BC. They probably came along the coast of the Eastern Mediterranean, through what is now Israel and Lebanon. They almost certainly knew how to paddle small boats along the coast. When they got to Greece, these people lived, like their ancestors at Blombos Cave in Africa. from gathering wild plants and by fishing and hunting wild animals with traps and with bows and arrows. They may have traded obsidian to West Asia, Central Asia, or Northern Europe. Paleolithic people in Greece used stone, wood, plant fibers, and bone to make fishhooks, spears, knives, and scrapers. They did not build houses, but lived mainly in caves along the coastline. 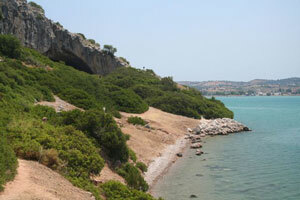 One example of a cave where people lived in the Old Stone Age is Franchthi Cave. The people living in Franchthi Cave hunted deer and rabbits, caught fish, and gathered mussels and clams, wild grain for bread or porridge, wild peas and beans, fruit, and nuts. Cite this page: Carr, K.E. Paleolithic Greece – the first people. Quatr.us Study Guides, July 9, 2017. Web. April 21, 2019.